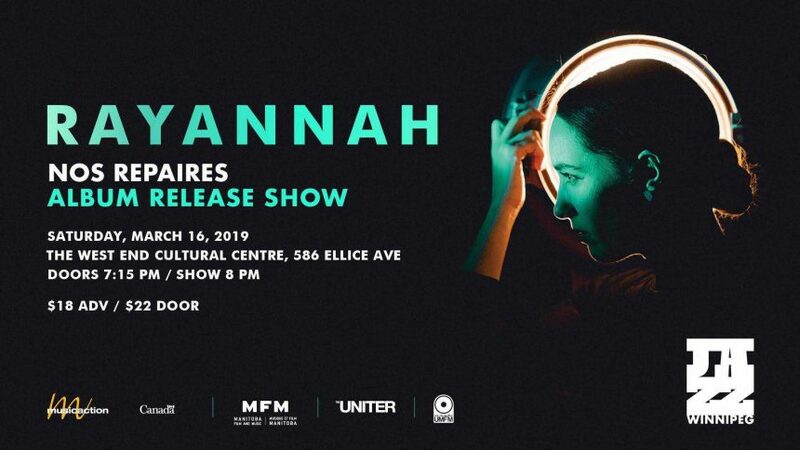 Rayan­nah releas­es her much-antic­i­pat­ed debut full-length album, ​“Nos repaires (Our Haunts),” due out on Fri­day March 8, fol­lowed by an album release con­cert at the West End Cul­tur­al Cen­tre on Sat­ur­day March 16. The record show­cas­es Rayannah’s unique elec­tro-soul sound, and fea­tures songs cre­at­ed over a five-year span. Under­scored by intri­cate beat-mak­ing and dense sound­scapes, most of the songs on this record are sung in French, but emo­tion tran­scends lan­guage to pull lis­ten­ers into a world both dark and sweet. Audi­ences can look for­ward to a live show fea­tur­ing mem­bers of Roy­al Canoe, Pon­teix, the Dirty Cat­fish Brass Band, and mul­ti-instru­men­tal­ist Mar­jorie Fiset. The evening will also fea­ture live pro­jec­tions by Saska­toon-based visu­al artist Stephanie Kuse, and set design by Miguel Forti­er. Both Stephanie and Miguel col­lab­o­rat­ed with Rayan­nah in Novem­ber 2018 for her Jazz Win­nipeg NuSounds show, wow­ing audi­ences with metic­u­lous and art­ful visu­al design and aesthetic.